Cloned from Mooch by afrojet. 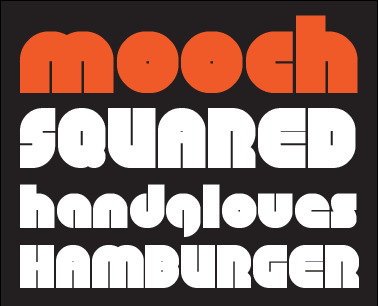 See also NCD Mooch Squared by djnippa. Clone of Mooch. A squared off version with an attempt at an uppercase. Info: Created on 1st December 2008 . Last edited on 22nd June 2009. I agree. That capital 'S' looked ugly. I've updated it with a new capital 'S' and 'Z' and I'm pleased with the result. Thanks for the nudge Intaglio. You can always vote again. It will replace your previous rating. Excellent stuff, but Upper Case S, U, V & Z need work plus Lower case U & V, plus the numbers 2 & 7. I can dig it, thanks! I like several of your typefaces/fonts. I just joined the site earlier and i'm loving it so far! How did I not know about this site already!!! Ughhh!